April 15, 2019 is Tax Day. 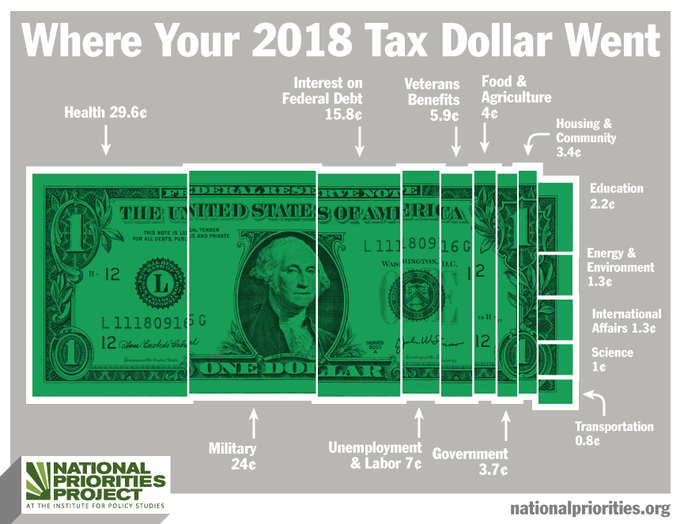 Do you know where your tax dollars are? Here's a hint: military contractors cost the average taxpayer more than the price of a new Macbook Pro, but public housing costs the average taxpayer less than a curling iron from Wal-Mart. The average American paid about $14,400 in federal income taxes in 2018. Out of that, about $3,500 went to the military. And out of that, $1,700 went to military contractors. Just $695 went to the troops. That's nearly three times as much money for contractors as it is for the troops. The biggest federal contractor, Lockheed Martin, made out with $48 billion in Department of Defense contracts in 2017 (the most recent year for which full data are available.) On your average tax receipt, that looks like a charge for $230, for just one company. The average tax bill for military contractors, $1,734, is more than the average for Medicare ($1,639), veterans' benefits ($848), or food stamps/SNAP ($326), and way, way more than the average taxpayer contributed to K-12 education ($101), the Environmental Protection Agency ($37.50), or public housing ($9.79). For the average tax receipt for the U.S. or your state, or to get your personalized tax receipt (just type in line 15 from your 1040), visit our tax receipt. Read our Seven Surprising Tax Facts (pop quiz: was the highest U.S. income tax rate above 50 percent, 70 percent, or 90 percent?). Read more eye-popping comparisons in Where Your Tax Dollar Was Spent in 2018. Check out the landing page with all our Tax Day 2019 resources. And don't forget to tweet or Instagram: our social media graphics are here.